No survey team could ever be complete without its undergraduates! 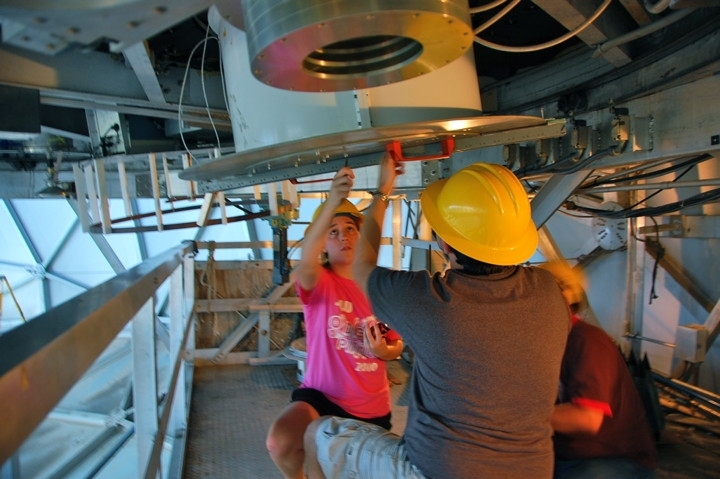 Undergrads control the world's largest radio telescope! 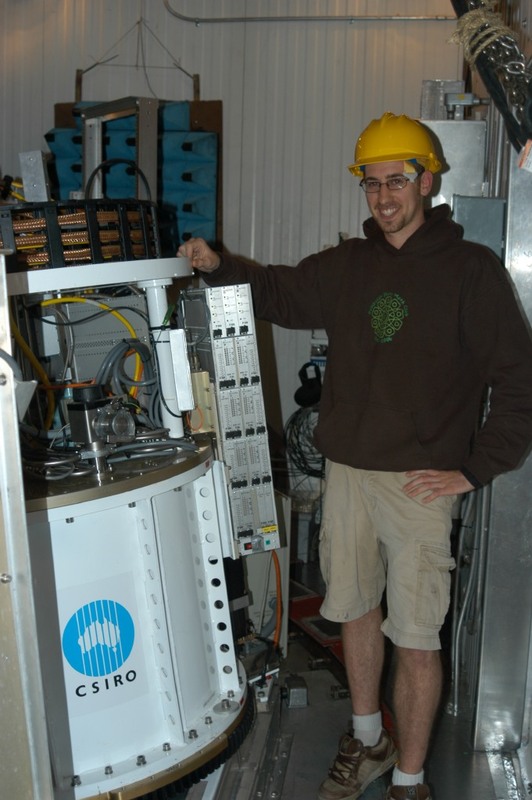 Arik Mitschang (Humboldt State Univ '06) gets to see ALFA up close in February 2006. Photo by Dave Kornreich. 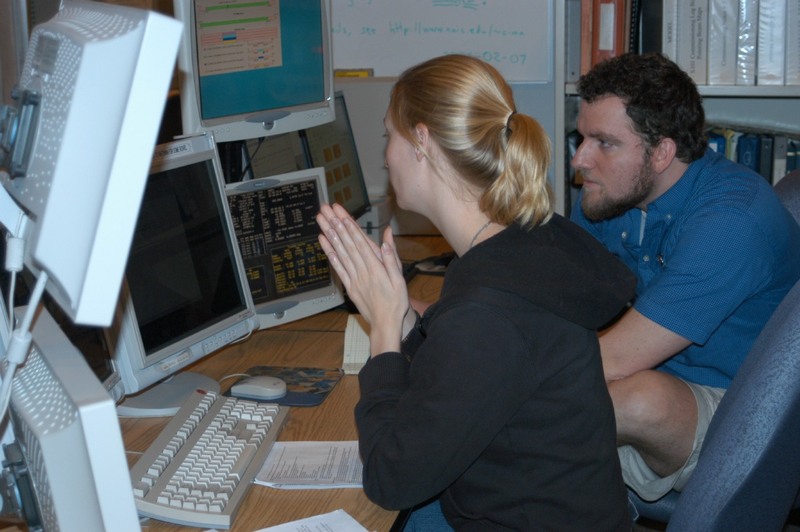 Heather Cutler (SLU) and Phil Patrick (Colgate) remove the ALFA cover in November 2010. Photo by Aileen O'Donoghue. 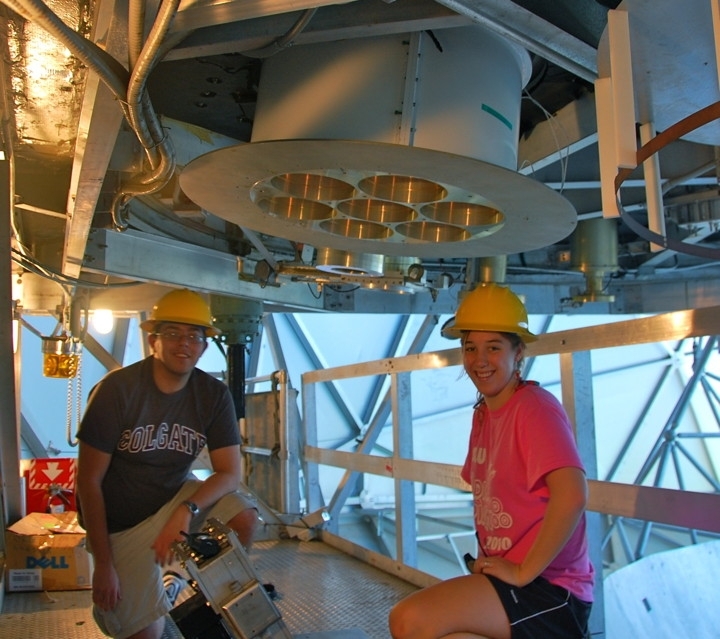 Phil Patrick (Colgate) and Heather Cutler (SLU) inspect ALFA after removing the cover, November 2010. Photo by Aileen O'Donoghue. Aileen O'Donoghue (SLU), Heather Cutler (SLU) and Phil Patrick (Colgate) on the platform, November 2010. Photo by Juan Marrero. Bilal Mahmood (Union '08) "drives" ALFALFA in December 2005. Photo by Becky Koopmann. Brian Walsh (Colgate '06) "drives" ALFALFA in January 2006. Sabrina Stierwalt (Cornell grad) looks on. Photo by Tom Balonek. Amy Furniss (Humboldt State Univ '06) and Shea Brown (U Minnesota grad student) keep a watchful eye on ALFALFA in February 2006. Photo by Dave Kornreich. 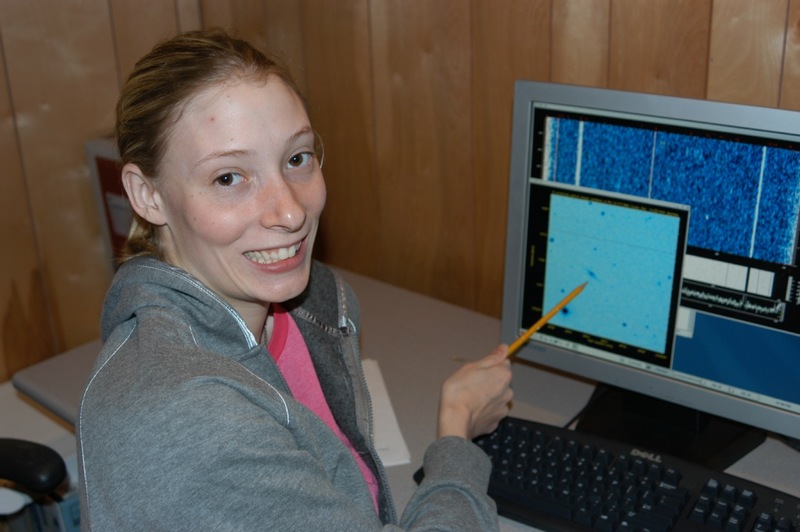 Amy Furniss (Humboldt State Univ '06) discovers a galaxy in a quick look of last night's data. 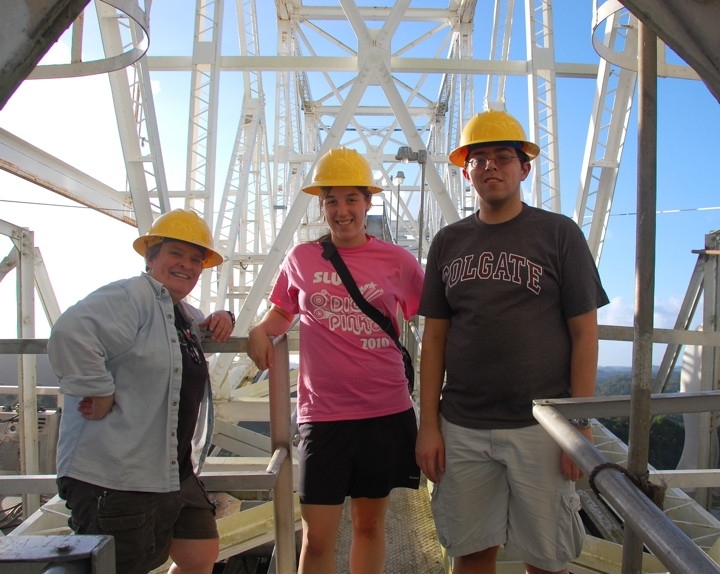 The first NSF-funded Undergraduate ALFALFA team workshop was held Jan 13-14, 2008 in Arecibo. It was a huge success, and we all had more fun than human beings should be allowed to have (thanks to Dave K. for such a marvelous description). 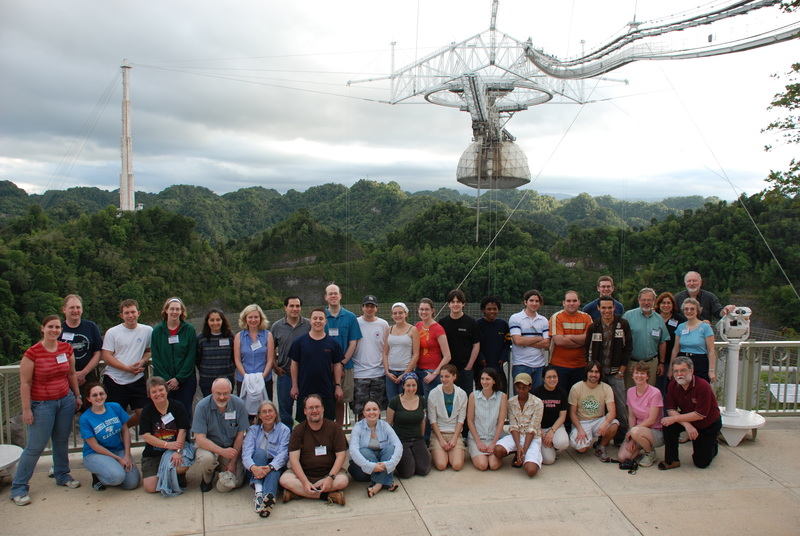 Thanks to everyone at the Arecibo Observatory for their help and support with logistics, the tours and keeping our stomachs full, our friends at Union, especially Becky, for their help with organization and reimbursements, Brian, Sabrina, Lyle, Riccardo, Martha and Dave for their lectures and demonstrations, and the NSF for making it all possible. 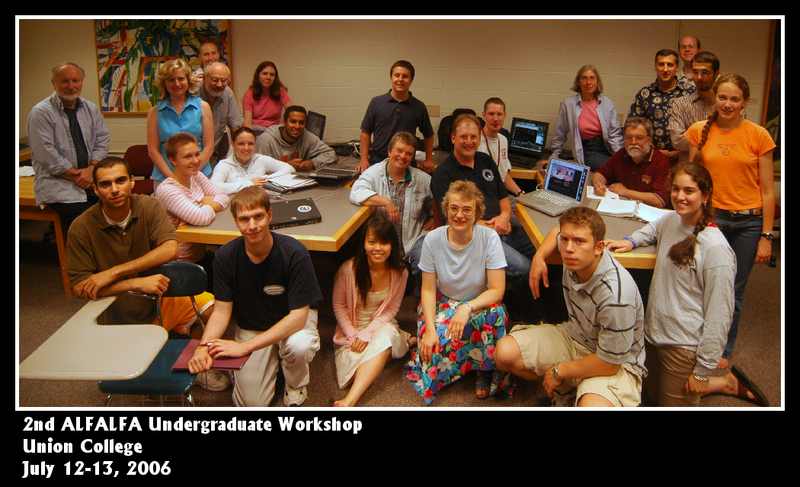 The second 2006 ALFALFA Undergraduate workshop was held in July 12-13 2006 at Union College. It was a rousing success. Thanks to Becky and the friendly folks at Union for hosting us, to Bob Brown and Hector Hernandez for allocating us a short observing block, and to the student and faculty participants (from Colgate, Cornell, Lafayette, Rochester Inst. Tech., Skidmore, St. Lawrence, Wesleyan, Wellesley and Union) for all their hard work! 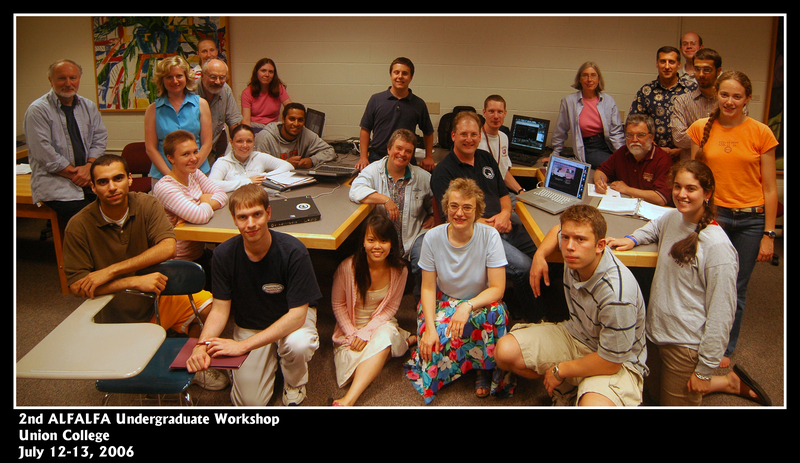 In July 2005, we held a small workshop for undergraduates who are engaged in summer research related to ALFALFA. 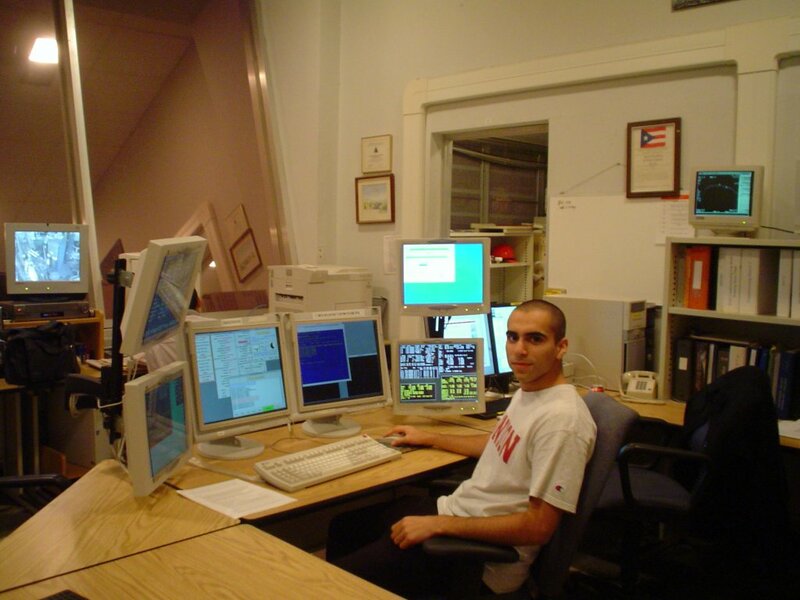 In addition to lectures on radio astronomy, the Arecibo telescope and ALFALFA, the students conducted observations with the Arecibo telescope for 1.5 hours, controlling the observing program remotely in the meeting room. On the second day, they reduced the data and began to analyze the dataset. Stay tuned for more results soon!